PayOne Gateway is an unrivaled transaction processing solution that authorizes multiple payment methods such as credit, debit, prepaid and closed loop cards via different payment channels, including Points of Sale (POS), web, mobile, Mail Order / Telephone Order (MOTO). The Gateway allows acquirers, aggregators, payment service providers and merchants to benefit from a 360-degree electronic payment cycle that encompasses transaction authorization and presentment, fee distribution, as well as settlement and reconciliation with financial back-ends. This ensures that merchant and acquirer data remains consolidated via a unified system regardless of the payment method or channel. PayOne Gateway is compliant with Verified by Visa (VBV) and SecureCode. With different levels of control over user experience, PayOne simple and secure one-time integration enables merchants to accept credit cards in addition to several domestic payment methods. This includes native mobile application integration SDKs and familiar shopping carts plugins. PayOne payment screen automatically detects the card type and routes the transaction to the most convenient and least expensive back end without requiring any intervention from the user. PayOne can store customer card details on behalf of the merchant and utilized tokenization technology to enable a “one-click payment” user experience that is 100% controlled by the merchant without being liable for PCI compliance overhead. 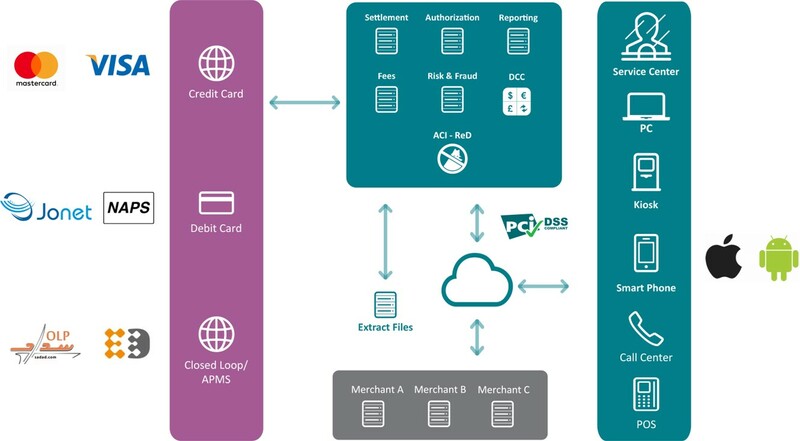 Extended under PayOne Gateway and PayOne ezGov, the ACI ReD Shield advanced fraud prevention solution helps minimize chargeback rates and false positives, subsequently maximizing revenues. Moreover, it reduces the time and costs associated with manual reviews, enabling users to safely expand into new markets and deliver fraud mitigation strategies that are both customized and business-focused. Dynamic Currency Conversion (DCC) – also known as Cardholder Preferred Currency (CPC) – allows cardholders to make international product and service purchases via the World Wide Web and Points of Sale (POS) using their cards’ local currencies. This provides significant additional revenue streams for acquirers and merchants, as well as an enhanced service that allows cardholders to benefit from competitive and immediately visible foreign exchange rates at the time of purchase. DCC can be offered as an optional add-on service along with other core solutions such as PayOne Gateway or PayOne ezGov, both of which are open for integration with any third party DCC provider. The Electronic Funds Transfer at Point of Sale (EFT POS) Management and Field Support solution is delivered by a highly qualified and competent Support & Service Team. The solution offers government entities, banks, service center providers and card distribution centers around-the-clock support, ensuring that their needs are met in an efficient and professional manner. STS PayOne supplies and installs the leading American electronic payment system, EFT POS, with the help of the largest onsite support team in Jordan, which comprises STS PayOne field representatives who are dedicated to serving merchants across all areas of the country.